What Safe Will Work For Your Needs? Whether you’ve just decided it’s time to invest in a security safe, or you’ve been looking for a while and aren’t sure which one to choose, at Colorado Security Products, we want to help you find a safe that perfectly suits your needs. With so many styles, options and features on the market, figuring out what you need to best protect your valuables can be a challenge. If you are in the market for a safe for your home or business, there are a few things you should think about to help you determine the best way to protect your valuable possessions. One of the main things you should consider when you’re in the market for a safe is fire protection. If you are using your safe to store important documents and valuables, then chances are, you should invest in a fire safe. Typically, a fire safe consists of two metal boxes nested inside each other with some type of insulation in between. While there is no such thing as a truly “fireproof” safe, there are various ratings. When shopping, look for information regarding how hot the inside of the safe will get during a fire. Since paper starts to char at 450 degrees, you want to make sure that a safe used to store important documents will not reach this temperature during a fire. Are you looking for a way to protect something large like a gun collection or something smaller, like mortgage documents, marriage licenses, passports and birth certificates? Safes come in pretty much every size imaginable. From small safe that will only store a few documents to large vaults that can house entire collections of valuables, there is a safe that is adequately sized to meet any need. When deciding what size safe you need, consider both your current needs and your potential future needs. A safe can be a once-in-a-lifetime purchase, so you want to make sure that whatever you purchase will work for you for several years. When you buy a safe, one of two things will usually happen: You will grow out of it, or you will grow into it. If you don’t want to purchase another safe in a couple years, find one that you can grow into. The type of lock your safe has should also be a major concern. If you are looking for the highest possible level of security, opt for a safe with a combination lock. High-quality electronic locks are also a good choice, however not all are EMP (electromagnetic pulse) resistant. Key locks are not recommended for maximum security. Safe manufacturers use a lot of sales pitches to try to get you to choose their safe over the competition. All of this information can be really difficult to sift through and understand. Instead of falling for advertising and marketing ploys, look for the true rating of a safe’s security – the Underwriters Laboratory Security Rating label. This label will provide you with information regarding exactly how secure the safe is. If there isn’t a label, look for a different brand. In addition to ensuring the safety of your valuables, the security rating may also be important to your insurance company. For specific guidelines and limitations, contact your insurance company prior to purchasing a safe. 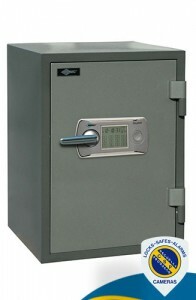 At Colorado Security Products, we offer the best safes available in Denver. Our AMSEC safes are available in a number of sizes, colors and styles, and they have varying security ratings and fire ratings to ensure that you can find the perfect one to suit your needs. From cash boxes to large gun safes, we have it all. Colorado Security Products has been providing home and business owners in the Denver, Colorado area with high-quality safes and security products since 1977. We are committed to offering top-of-the-line products and advanced solutions to meet the unique security needs of every family and business. To learn more about the safes available from Colorado Security Products, to get help choosing the right safe for your home or business or if you need a Denver locksmith, please give us a call at 303-756-1000. We are also available for locksmith services and Denver security system installation, maintenance and monitoring.